There are many ways to save for college. One way is to put aside money each month and watch it grow in the bank. Another way is to work hard to create great academic records that will get noticed by colleges. When you have that Wow! factor, and a college's scholarship office describes your homeschool records as one of the very best scholarship entries ever seen, your hard work will truly be worth the time and effort! Michele is a homeschool parent like you. Her life is busy and complicated, and her children are not perfect. She is a normal parent with normal children. She also has experienced a huge success. I'll bet you would like to know how Michele did it! 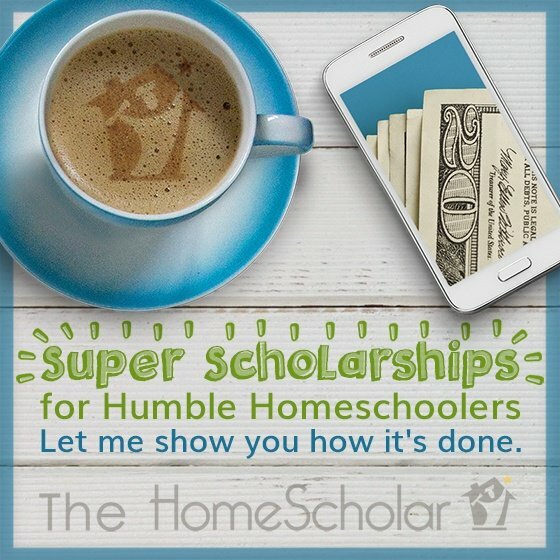 Super Scholarships are Available for Humble Homeschoolers! Learn more with my free class on scholarships. Here is Michelle's Story, and I'd like you to read her whole letter. She really wanted me to share it with you, and I can see why! It's filled with helpful hints and the voice of experience. While reading, celebrate with Michele, and glean nuggets of wisdom along the way. 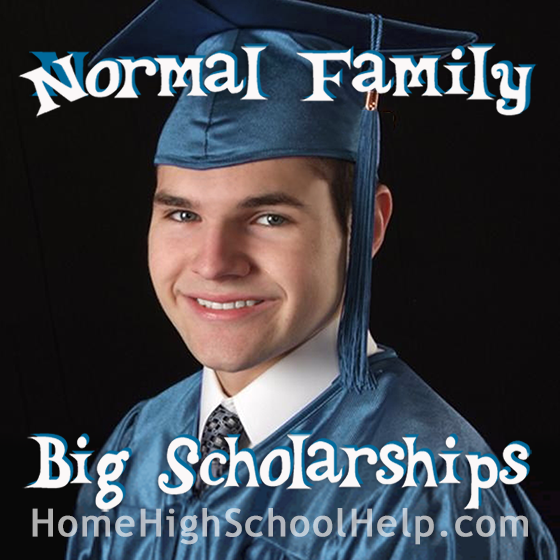 At the end, I'll give you my ideas on finding big scholarships for YOUR normal family! Please share my news with your listeners, if you think it will help them. My son (first-born of three children) is a senior this year and has been homeschooled his entire life. We've been doing the rather horrendous, overly-complicated process of applying to universities. Yuck! Thankfully, he was accepted to all four universities to which he applied: University of Tennessee, Mississippi State University, Clemson University and Georgia Tech. He wants to be a Civil Engineer, and large state schools or extremely expensive private schools are about the only ones in the Southeast that offer certified degree programs for Civil Engineering. (And a special note: Georgia Tech was rated the number four engineering school in the country by U.S. News and World Reports, behind MIT, Stanford, and Cal-Berkeley). Pretty cool being accepted to all four of his choices! But wait, there's more . . . he has so far received these academic scholarships (not based at all on financial need or on ethnicity or race): UT $24,000, MSU $62,000, Clemson $60,000. His final SAT score was good, but not in the very top, and he didn't do as well with some AP tests as he would've liked (those tests are tricky!!) but he still received some incredible scholarships. Woo hoo! And we're waiting to hear back on close to $40,000 more in other academic scholarships and engineering departmental scholarships within the next few months. Right now, it looks like UT and MSU will end up being completely free. We live in a state (Tennessee) that's great for homeschooling, but umbrella schools handle almost everything to do with transcripts. However, we decided to "do our own thing" and make additional transcripts and do the Comprehensive Record Solution that you had suggested. We bought your system through one of your webinars and read through your book (we purchased that through the Ohio convention a few years ago), and you can see how well it's paid off! Quite the return on investment! We still filled out all of the colleges' online applications, still submitted official ACT and SAT scores, still submitted the "official transcript" from our umbrella school, but then we submitted our extra "packet of materials" with two Lee Binz-style transcripts for my son (one by subjects and one by years), the entire Comprehensive Record with the detailed course descriptions, the activity list, and a reading and film list. I worked on that thing all summer long, but having your templates saved me hours and hours and hours!!! One lady who works in a scholarship office said it was one of the very best scholarship entries she has ever seen! It was so worth doing, and now, it'll be easier to do the Comprehensive Record Solution for my other two. Thank you, again! God has definitely used your program in our lives, and hopefully this will encourage others! Feel free to use our story in your blog or any of your literature. All of the credit for the inspiration as well as the nuts and bolts work for my son's Comprehensive Records goes to YOU!!! You program definitely works, and works well! Michele is a normal parent in a normal family, and so are you! Each family is unique in a different way, and that is why homeschooling is so effective. At the same time, there are certain themes that we can all apply to our homeschool. Let me share what I hear Michele saying. As Michele clearly explained, getting into college may involve a "horrendous, overly-complicated process of applying to universities." That's true. It's not a walk in the park. You can be prepared by keeping your homeschool transcripts and course descriptions up to date, so they are ready to go. Those records are remarkably difficult to whip up in a few minutes, and actually take some time and effort to create, so work on those in advance. Start the application process early, and learn as much about the college admission process as possible, well before senior year. In fact, Michelle wrote to me a year ago, with great advice about being prepared early. Michelle said, "Lee, you may want to warn your readers about this--my son is a junior and is visiting colleges in the Southeast right now. THREE of these colleges have moved their opening registration to AUGUST 1 of the senior year!! And this is NOT early action or early decision! So it's very important to get your ducks in a row over the summer before the senior year and iron out the transcripts EARLY!!! August enrollees are getting first choice of dorm rooms, etc., even though it's a year in advance!" Encourage your sweet, geeky kids! There are even more scholarships available if your child is interested in STEM degrees, like Michele's son. STEM stands for Science, Technology, Engineering, and Math. STEM careers are in high demand. Companies having difficulty finding enough qualified employees have resorted to hiring from overseas. These companies are giving large chunks of money to colleges, so they can provide scholarships for STEM students. If your child is interested in science, technology, engineering, or math careers, they may have an even greater chance of earning scholarships. Did you notice that Michele is technology-challenged? She may not choose a STEM path for herself, but she did recognize and encourage her child's interests. Go ahead and fuel those geeky interests. "We got back from our swim meet, and in Monday's mail, Gus received ANOTHER $12,000 scholarship from the College of Engineering at Mississippi State! That's their top departmental scholarship for entering freshmen within the college." This is a great example of the way scholarships come in waves. 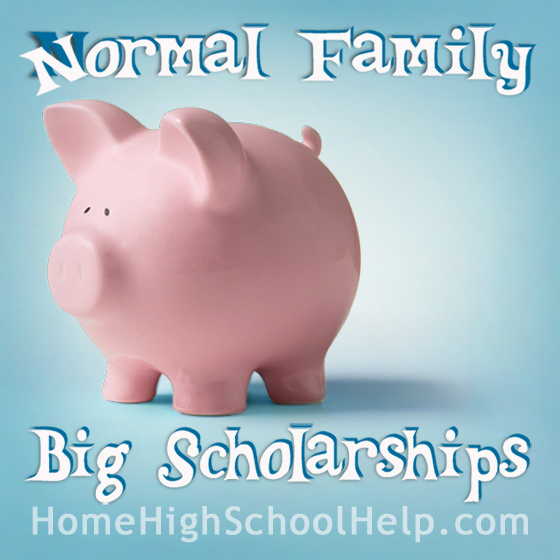 "I don't think a lot of parents know about departmental scholarships, or think they're only for upperclassmen (in some cases, I guess they are), but these sometimes go unclaimed. As you know, schools like MSU have recently made it that when you apply to the university, you fill out one application with several essays (and home school attachments!) and that submission is good for all of the university and departmental scholarships, but other schools have separate departmental applications. I know a lot of other parents don't always know this." 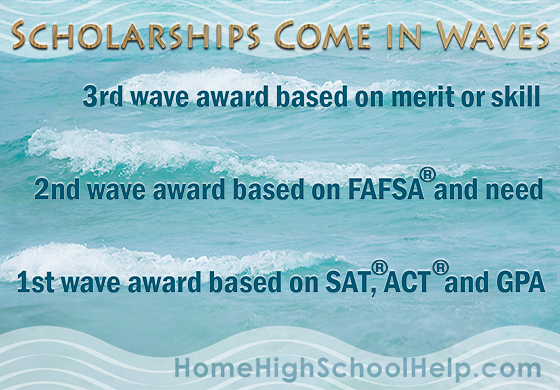 As Michelle and her family learned, some school scholarships may not be advertised, so make sure to investigate what each college offers. A college's sticker price may be astronomically huge, but if you position your child for scholarships, it can be remarkably reasonable. Great colleges, and average colleges, almost never charge normal students a sticker price. Of course, if you turn in your application late, with minimum effort, they may reward you with a sticker price! But homeschoolers are used to investing their effort in their children. Like Michele, some students might be able to go for free, with great scholarships and incentives, particularly when students choose an in-demand field like science, technology, engineering, or math. Comprehensive homeschool records can make a huge difference in college admission and scholarships. Colleges want to know the rigor of your child's homeschool education. They want to understand your homeschool's academics as well as they understand the local high school's, so give them the information they crave. Although your child might get in with a simple transcript, if you want scholarships, you may need to provide more. Describe your classes in an organized, clean, concise way that is easy for them to read and find the information they need. Think about the return on your investment when you are homeschooling. What are you doing to prepare your child for college admission and scholarships? Is it working? Is it worth it? You know how we want our children to become engaged in learning, and absorb information? We don't want them to only listen to ideas, we want them to learn, right? In the same way, you need to become invested in learning how to homeschool high school. There is a big return on your investment when you spend money learning to homeschool high school, and learning to create transcripts and course descriptions. For example, suppose Michele invested $200 in learning to homeschool high school, and her child earned $60,000 in scholarships. That, ladies and gentlemen, is a 3000 percent return on investment. As a homeschool parent, you have two roles in your child's academic preparation. First, you are the teacher or mentor, helping the child learn. But what makes you different is that you are also the principal or school administrator, responsible for your child's academic records. Don't let that scare you! It's not so hard to do, once you figure it out. It's as simple as paying bills, and you do that every day. It's not always fun, and it may be a chore, but it's not scary or terrifying. Find out how to create official homeschool transcripts, and thoroughly document your academics with comprehensive homeschool records. Learn the process of finding and applying to college, so you aren't caught off guard by the challenge. Michele is a parent like you. She is a normal mom, with normal children. She experienced great success. You can have success too! Now, I know what you are thinking. You are thinking "best scholarship entry ever seen"? That's not going to happen to me! And you know, maybe it won't look exactly the same, but you can still see some miraculous success. You don't have to be super-mom, with a gifted kid earning stellar grades from an accredited program. Michelle writes, "I'm a career procrastinator AND a techno-phobe, so if I can do it, any of your readers can!!" She went on to share the secrets she gives her local homeschool group. 3. Buy Lee Binz's Comprehensive Record Solution - and USE IT." Good things can happen to normal people! You can afford college! How? I want to show you how to earn BIG merit based scholarships you thought were reserved for the uber-intelligent or Olympic-level athletes. 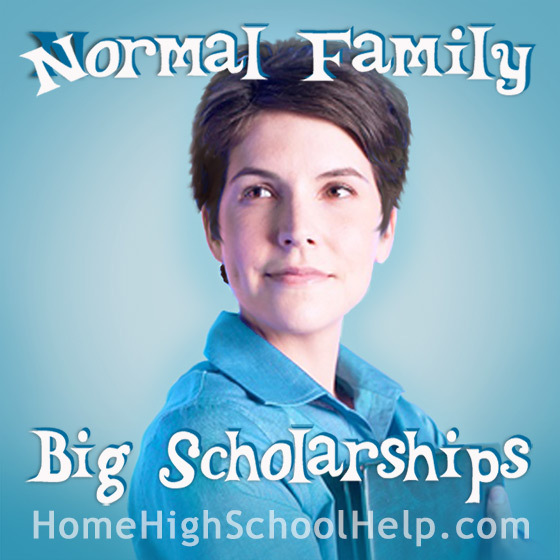 These scholarships are available for homeschoolers, even kids that are academically or athletically disinclined. 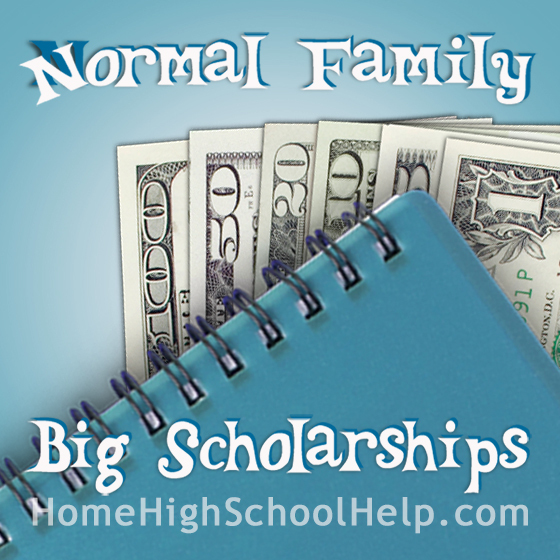 In fact, one of the best ways to position your kids for these scholarships is by leveraging the educational benefits available EXCLUSIVELY to homeschoolers. There’s nothing more stressful to parents than college admission and scholarships. Many parents question whether it’s even possible to find a college that is satisfying to both parent and child, a college that will love their student and offer them scholarships to attend. 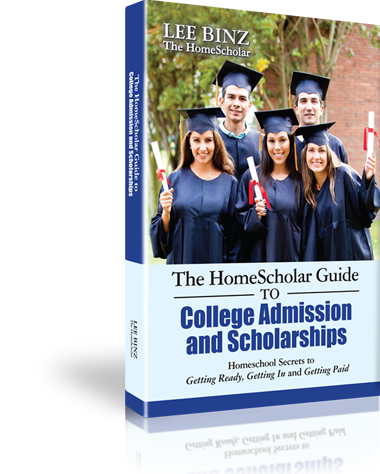 The HomeScholar Guide to College Admission and Scholarships puts these concerns soundly to rest. Author Lee Binz shares the principles she followed to help her own students achieve admission and full tuition scholarships to their first-choice universities. College admission is extremely competitive! Comprehensive records will set your student apart. The Comprehensive Record Solution is geared for parents who know they need to do more than “just a transcript.” It will enable you to create the transcript, but the focus is directed at much more, such as course descriptions, reading list, activities and award list, and work samples---all the elements that go into a comprehensive record. With The Comprehensive Record Solution, you will be able to create high school records that win college admission and scholarships, with step-by-step training, cut-and-paste simplicity, and four document reviews with Lee - so you will know your records are done right!